What is Benevolent Capitalism? Is it possible to make lots of money and have a thriving planet? 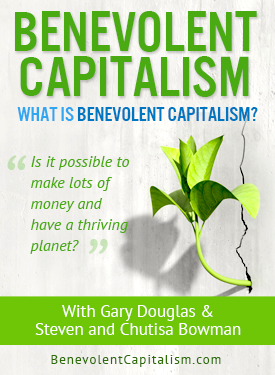 This MP3 download is the first audio of the 6-Part ‘Benevolent Capitalism’ Google Hangout series with Gary Douglas and Steven & Chutisa Bowman. Purchase other mp3's from this series HERE. For more information, visit www.benevolentcapitalism.com. Leading proponents of Generative Innovation and Conscious Benevolent Leadership for over two decades, Gary, Steven and Chutisa have also gained recognition as thought-leaders on the unconventional perspective of benevolent capitalism. Taken together, their spheres of expertise are highly relevant in facilitating organizations to re-think their business and to sculpt out prosperous, progressive and generative strategies. Gary, Chutisa and Steve facilitate people to know that they are the source for creating the change they desire and creating a life that goes beyond the limitations of what the rest of the world thinks is important. Benevolent Capitalism is as an essential aspect to creating a future that has greater possibilities in it for everyone as well as the planet. This is a priority not only for personal happiness but also for the ending of violent conflict endemic on our planet and creating a different world. If enough people choose to be more aware, more benevolent and more conscious, they will start to see the possibilities of what they have available to them and change what is occurring here on planet earth.